Chocolate and mint is one of my favorite flavor combinations! Well, let’s be honest here…chocolate pretty much pairs perfectly with everything! 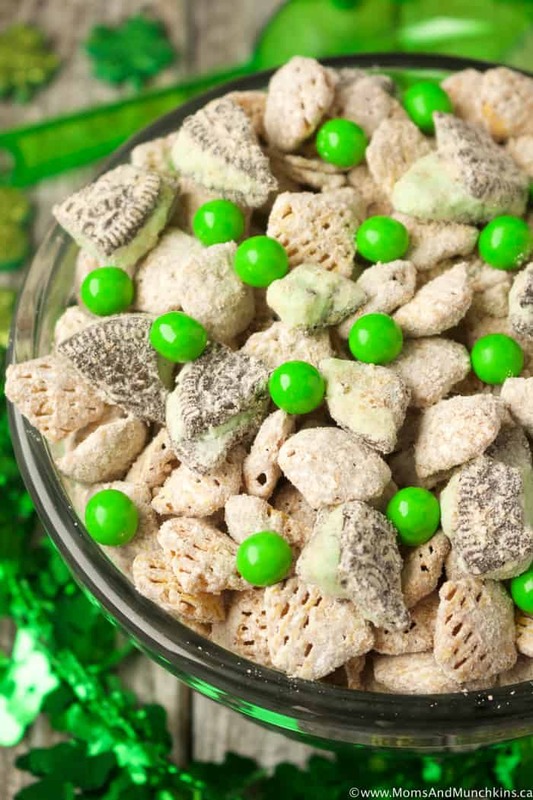 This Chocolate Mint Shamrock Mix makes a delicious St. Patrick’s Day snack mix. It takes just a few minutes to put together, no baking required and it’s great for a family movie night! What if you don’t like chocolate and mint together? No problem! Substitute the mint chocolate bar here with a plain chocolate bar (or semi-sweet chocolate chips) and the Mint Oreos for plain Oreos. How does your family celebrate St. Patrick’s Day? Do you wear green? Eat a special Irish meal? Enjoy green drinks while watching movies? Build a leprechaun trap? Have Lucky Charms for breakfast? I am part Irish but I must admit that we don’t do much to celebrate St. Patrick’s Day. I’ll wear green but that’s about the extent of it. 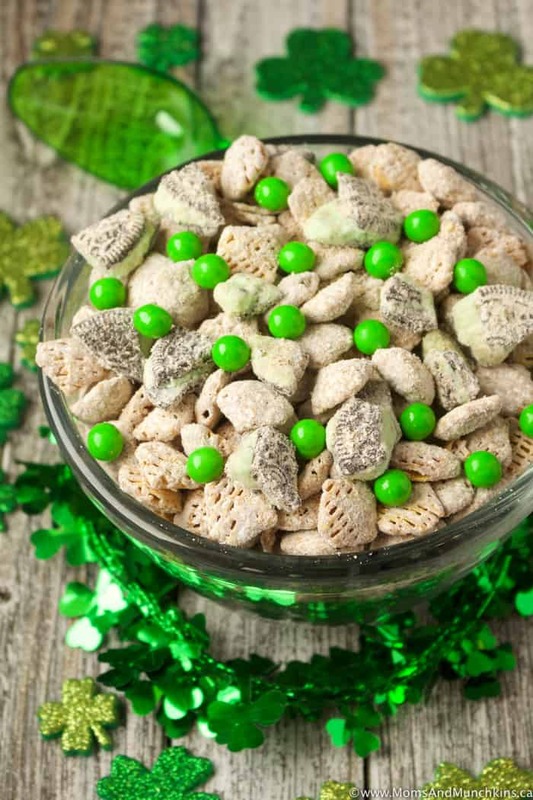 When it comes to this Chocolate Shamrock Snack Mix though, this is tasty enough to enjoy all year long! A chocolate & minty treat perfect for St. Patrick's Day. Put the Chex cereal in a large Ziploc bag. Place the broken chocolate bar pieces in a small microwavable bowl. Heat chocolate in the microwave, on high, for 30 second intervals. Stir between each 30 seconds. You want this melted and smooth but not really hot. This takes about 90 seconds. Pour the melted chocolate over the Chex, seal the bag and shake well to make sure all of the cereal is evenly coated. Pour in the icing sugar. Seal the bag and shake well to evenly coat. Pour in the Mint Oreo pieces, seal the bag and shake well again to evenly coat. Pour the mix into a serving bowl and sprinkle on green candies. 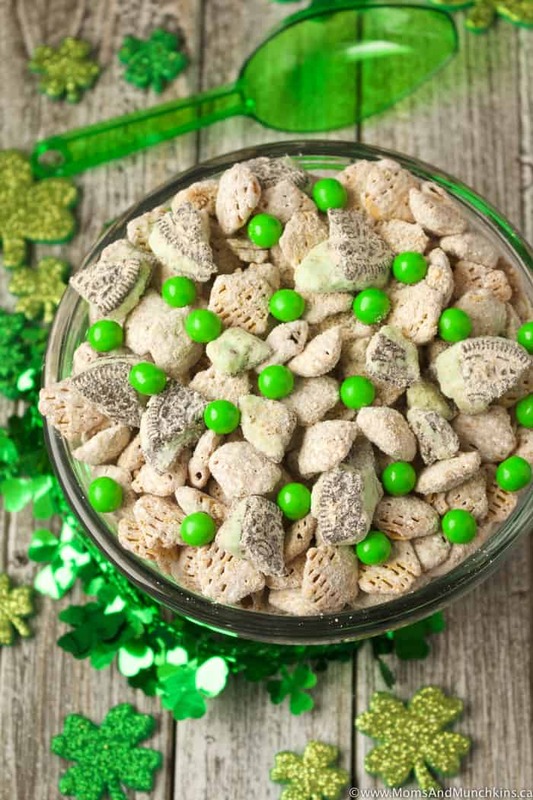 Visit our St. Patrick’s Day page for more fun ideas like St. Patrick’s Day desserts, cupcakes, cakes, Irish meal ideas, party ideas, free printables, favor ideas, activities and much more. What is your favorite chocolate combination? Chocolate & mint? Chocolate & peanut butter? Chocolate & caramel? Anything with “chocolate” in the title is a hit with me! Great for parties. Colorful and easy to prepare!! Sounds delicious, and totally festive! Stopping by to pin this and let you know I featured it on my blog today!